Necessity this time was created by Rosebud. She asked for some diesel to help saturate the burn pile… and promptly spilled it on herself. Soaked to the skin. Including her clothing. Nothing to do but call someone who’s spent plenty of time soaked in all kinds of noxious substances – our ubiquitous friend Pete! What a blessing he’s been to us this year – we’ve learned SO MUCH. Apparently, Pete’s mom Donna is the Laundry Fairy and has learned all kinds of tricks out of the sheer desperation caused by Pete coming home drenched in all kinds of unmentionable yuck. The trick to diesel removal? Oxygen bleach. LOTS of oxygen bleach. … it helped quite a bit. The jeans were still a bit whiffy after they went through the wash, but they were tremendously improved from their original state. 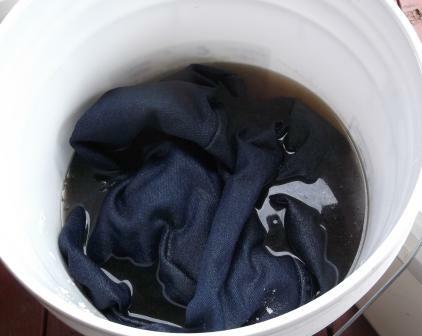 Rosebud’s shirt went in for another soaking, and I have high hopes that it will be diesel-free once it’s been laundered again. Rosebud herself wasn’t smelling any too rosy either. The trick there was to have her lather up with vegetable oil (makes sense; diesel is oil-based), then to wash thoroughly with a grease-cutting soap, such as Dawn dish detergent. That worked great! We’ve been using that tip for a week now. The end of the bonfires is in sight – the last of the roots went on the pile today. Hallelujah! This entry was posted in Hair and Skin Care, Projects, The Inmates, The Present Insanity and tagged clothing, diesel, get diesel out, getting diesel off skin, getting diesel out of clothing, washing clothes, washing skin. Bookmark the permalink.